"Because, Doug, they have nobody else - these are the ones our Lord was talking about - we have no choice." Fr. Tom Hagan's response to Doug Campbell's question as to why we continue to help even after many killings and theft. 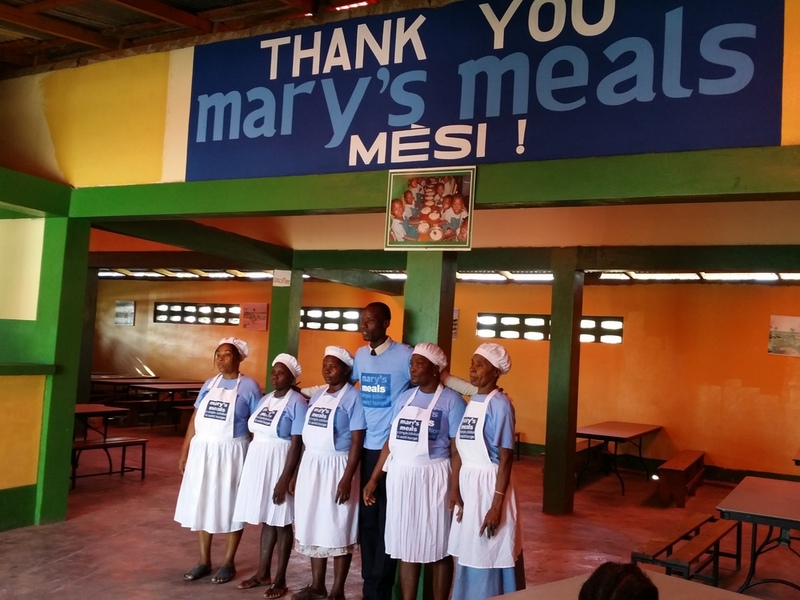 Father Tom spends his days in Haiti anchoring the activities at our Hands Together compound in the slum of Cite Soleil and the rural area of Gonaives. He has seen much suffering and trouble, but he has also seen miracles…in the many smiling faces of children who are learning in the only free schools in the slum and are getting fed a hot meal, he has seen miracles in young men who have turned away from lives of crime to caring for their neighbors, and in the elderly who have fellowship and feel valued as they can share their wisdom with the school children and our HT workers. Father Tom lives each day in Haiti by putting everything in God's hands. He says, “I could not last a week without my prayer life – giving everything to Jesus is the only way to find the strength to face each day in this very difficult place.” We will be sharing stories from Haiti from Fr. Tom, Doug and other HT workers who have invested so much of their time and energy to helping the wonderful people of Haiti. We hope you’ll be encouraged, enlightened, and blessed. Each morning at about 9am the elderly arrive at four Hands Together Elderly Centers: Saint Francis DeSales High School, St. Ann School, Doctor Fanfan Clinic and Archbishop Miot School. On any given day there could be as many as 800 elderly and on special days when there are celebrations of birthdays, etc., there have been as many 1,700. Each elderly person has his or her blood pressure checked and all health concerns are passed on to the Hands Together doctors. There is often entertainment and other social activities. The students in the schools are encouraged to engage the elderly and to make them feel welcomed. At Saint Francis and at Archbishop Miot schools there are literacy classes given to the elderly as well. They are also given a hot meal before leaving at noon time. Four times a year: Christmas, Easter, Mother's Day, and a day in September each elderly person receives a bag with rice, beans, cooking oil, canned fish and sauce to feed about 35 people. This would be a great project for a parish in the USA to adopt for those that are interested in sponsoring a project in Haiti. Small rural parishes are not always the first place that come to mind when organizations start mapping out locations from which to make financial appeals to help support the ongoing costs of the work that they do. However, many times, its exactly those parishes and communities who are most responsive to the needs being served. That is certainly the experience I have had over the last 10 years of mission work (the last three of which have included appeals for the work of Hands Together) supporting the poor in Haiti. This June found me on the road to two small parishes in beautiful (bountiful) central Iowa in the Diocese of Des Moines. Sts. Peter and Paul parish in Atlantic, IA, and St. Mary’s parish in Anita, IA, serve a rural Catholic population of only about 450 families combined, but the dedication of the parishioners there is such that both church sites are beautifully kept and joyously served. Upon my early introduction and planning for the trip, Church administrators Mary Jo and Charlotte briefed me on every detail of the parishes, the towns and the people who would be listening to my appeal for help for Hands Together. Mary Jo also informed me that their pastor, Father David Lusi, wanted very much to spend extra time together over dinner to learn about the work in Haiti, which we did over a well-turned country dinner at a diner owned by one of the parishioners. Our first appeal was at the 125-year-old parish of Sts. Peter and Paul in Atlantic. No sooner had I arrived than did I get off on the wrong foot, (or at least in the wrong direction). Mary Jo had warned me the parish was doing a face lift on their centenarian church building and that mass would be in the parish annex. Imagine the deacon banging on the old church door to get in to see Jesus, only to be ignored, because Jesus wasn’t there. Happily, one of the parishioners (a more enlightened and totally tolerate lady), saw my dilemma and got me on the straight and narrow to the proper location. Arriving at the vesting area a few minutes later, I was greeted by two lively fourth grade servers who promptly informed as to how mass was offered there and what to expect from Fr. David. I also asked them what they knew about Haiti. They didn’t have a notion about Haiti, but they were totally familiar with Christopher Columbus and rapidly made the association with the part Hispaniola played in the history of our Western Hemisphere. Shortly, Fr. David came in and we all headed for the parish multi-purpose room wherein mass was prayed. After mass as I was greeting the people, I found that I wasn’t plowing new territory. The peoples’ knowledge of Haiti and Hands Together had already been introduced to them by Fr. Tom when he made a visit to Des Moines last year. Many of the people at St. P&P had been in attendance and wanted to continue to help what he had already introduced them to. Another aspect pertinent to Haiti and this rural enclave was that the town churches sponsor an ecumenical mission trip to Haiti every year. The churches get together and parishioners from each parish go to Haiti as group to build houses and provide support for schools in a rural mountain village. That mission trip was in progress during the time I visited, and many parishioners were excited to tell me about it. Our evening concluded with dinner with Fr. David and preparation for mass the next day. On Sunday, we had two masses, the early one at St. Mary’s some 12 miles away and then a mid-morning mass back at St. P&P. The enthusiasm for our visit continued, and we knew when we left, we would leave many new friends behind. Our morning wrapped up with brunch with Fr. David, and we left the idyllic central Iowa setting pretty much as we found it, but ourselves wonderfully affected by the warmth and love we found in this summer weekend respite in rural Iowa. Hands Together celebrates the one year anniversary of the "Se Posib" Project (It is possible). This project has ten young men who are in their early twenties and a year ago they were being sought out by the police. They could not read or write and were ashamed of this. Hands Together began teaching them every day and they now can read and write well and they have also received training in computers. Hands Together arranged for each of them to have driver training and all of them now have their licenses. Just this past week they began staffing the three "special schools" as physical education teachers and mentors. They have completely changed their attitude and now they are showing every sign that that they have faith in themselves and in their futures. Hands Together now has eleven schools operating in Cite Soleil. Three of these schools are "special schools or Barefoot Schools" that serve the street kids who often have no parents and many have no clothes. These children demand a great deal of structure and individual attention. They usually do not adapt well to a traditional school setting, but our special schools are equipped to handle their unique makeup and situation. This past October Hurricane Matthew dealt a devastating blow to Haiti. Our school and compound suffered damage. The hurricane destroyed the wall surrounding our high school as well as the wall behind our center. Unfortunately, thieves were able to take advantage and stole a great deal of material. Thankfully, the two walls were repaired at a great deal of expense and the work was finished this week. Every so often, Father Tom sends an update as to what is happening at our headquarters and the various projects we're working on. You will read about the successes and challenges that Fr. Tom, Doug, and the HT staff face. They appreciate the prayers of our friends and donors and these updates will help keep everyone informed. 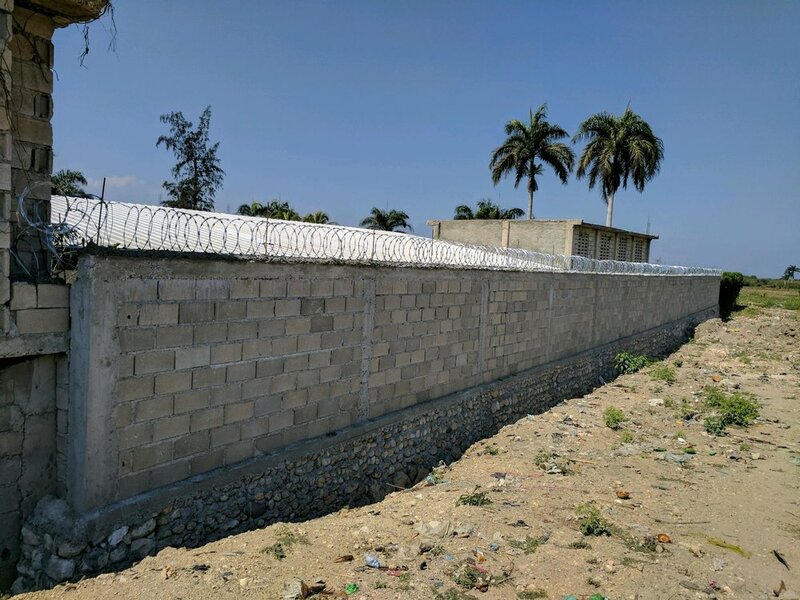 Hands Together has begun a program to reach out to the prisoners confined to the penitentiary in Port au Prince. They suffer greatly as the conditions are very bad. Every week Hands Together will visit the prison and bring soap and other needed supplies. St. Agatha parish in Columbus, Ohio is working on this project. We mourn the loss of Terry Wadsworth, a former board member and devoted longtime friend of Hands Together. Terry passed away after a battle with PSP, a degenerative, neurological disease. Terry was a champion for the poor in Haiti, having presented 4 to 5 appeals per year for over 15 years. He was a dearly loved friend to Father Tom and Doug and they are so thankful for he and his wife Christina’s heroic efforts for HT over the years. He will be missed, but his impact on us here at Hands Together and the poor in Haiti will live on. The three kitchen managers will report once a week to Delmas HQ under the direction of the Director For Food - Evans. Evens will become the Director of Feeding in September after working three months in training. An effort will be made to invite on Hands Together web site volunteers who would be willing to come and teach in English the subjects of math, science, etc. The young men of Cite Soleil slum who participate in gang life are actually in many ways good young men. But they are men who are desperately poor and who have little – if any – self-esteem, convinced that they have little value or worth. There is as much as an 80% unemployment rate in Site Solei. There are very few opportunities for them. The majority of them have little or no education. Many of them are humiliated and embarrassed when they are asked to sign their name. They have not received much love in their short lifetime. Hands Together has been working in the Site Solei slum since the fall of 1996. In the first early years, we received a great deal of advice to simply ignore the young gang members because any association with these young men would permanently tarnish the reputation of Hands Together. We were told that they were crazed and very dangerous. There was a very popular documentary called The Ghosts of Site Solei that portrayed them as evil and dangerous gangsters. Their leader Tupac was portrayed as a psychopath who was intent on simply causing violence. But slowly the staff of Hands Together began to see another side of them. These young "gangsters" would be seen helping the elderly, organizing soccer games for young boys and with a great deal of joy and enthusiasm distributing packages of food to the needy in their communities. On one particular day back when there was a great deal of political and civil turmoil in Cite Solei after President Aristide left the country -- it was becoming increasingly clear that the very poor of Cite Solei, especially the elderly and the children, were starving. The leader of the gang, along with all gang members and the staff of Hands Together fed over 200,000 people in one day. Hands Together supplied the food and they distributed it all in a very orderly fashion. As a Catholic priest I began to feel more and more like a father to them. I would listen and talk with them. Many times I would get angry with them -- especially when they would participate in the violence. I would cry with them and I would laugh with them. I would preside at many of their funerals. The years have gone by and I find myself now in 2013 still having a big space in my heart for all of them. Many of them if not all of them really do not want to participate in violence. They want a job and they crave for a life of normalcy. Tragically, and I don't know why but through the years many politicians have taken advantage of them often offering them money if they would participate in disrupting a political demonstration and do things that would create instability. Over the years I have been a fool often accepting their lies or excusing their lives. But, I find myself more than ever loving them and wanting them to change. I pray every day for them and and I ache when they die.